Once in a while, don’t we all need to get away to breathe fresh air, count the stars and stuff ourselves with grilled marshmallows. Time to get the camping gear out. Camping attracts travellers from all walks of life, even if everyone has a different idea of the perfect escape. Some see it as an opportunity to switch off completely and find a quiet spot in nature. For others, the most important thing is to enjoy quality time with family and friends. A camping trip can be a fun way to keep accommodation costs to a minimum or a reason to splash out on the latest glamping experience. 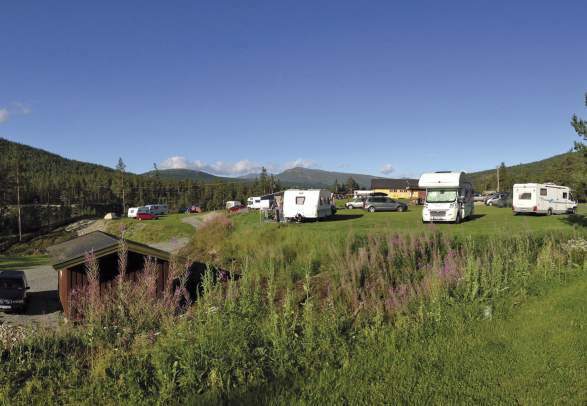 In Norway, there are around 1,000 campgrounds to choose from. Most sites offer a spot for your tent, caravan, or motorhome, as well as camping cabins of varying standard. Escape the crowds and stay on a camping site next to a fjord, by the sea, or in the forest. If you’re heading to the fjords, camping can often be the ideal starting point for excursions. 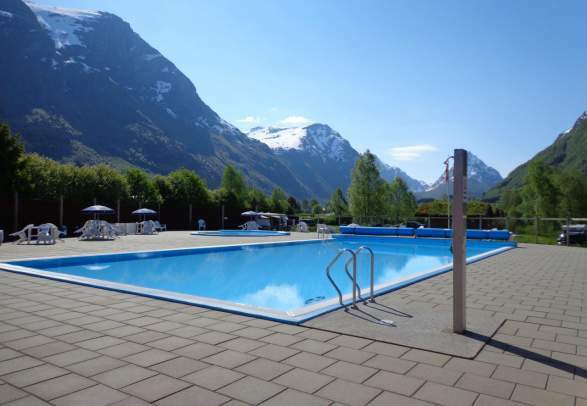 You can wake up next to the Geirangerfjord, or choose a campsite within easy reach of the fjords and glaciers by the Sognefjord. 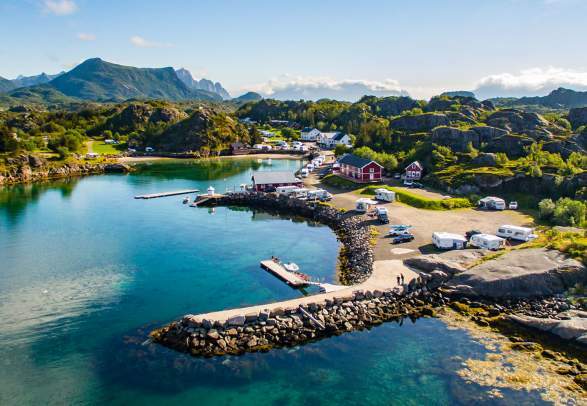 Further north you’ll find sheltered bays with white sand beaches and turquoise water, surrounded by craggy mountain peaks and ... hang on a minute, in Norway? Yes, really! Try camping in Lofoten – you might be surprised. In the eastern parts of the country, you have vast forest and mountain areas that work a treat for campers who are interested in hiking, fishing, and cycling. Read about all the things you can do in the great outdoors of Norway. You can rent a car, caravan, or motorhome with Auto Europe. For total freedom, nothing beats camping in the wild. as long as you follow the simple rules set out in the right of access (“allemannsretten” in Norwegian). For example, you are not allowed to park or camp closer than 150 metres from an inhabited house or cabin. as long as you follow the simple rules set out in the right of access (“allemannsretten” in Norwegian). For example, you are not allowed to park or camp closer than 500 feet from an inhabited house or cabin. The mountains of Jotunheimen and the Lofoten Islands are two popular areas for the most adventurous campers. For a less remote option, you can pitch your tent on the Langøyene island in the Oslofjord. If the prospect of being left to your own devices sounds a bit too daunting, an alternative is to stay at a wilderness camp. Perhaps you are tempted by a holiday in the wild, but just not prepared to do without modern conveniences? Then “glamping” which stands for glamorous or luxury camping, might be just the ticket. Several places in Norway you can stay in large, beautifully furnished tents and sleep in an actual bed with bedclothes. Many of these places also offer local food and nature-based experiences. For a camping experience with hotel standard self-catering facilities, look for five-star campsite cabins. In some places, you can expect your own flat screen TV, DVD player, sofa, kitchen, and a private bathroom. Other places focus on architecture and design that blends in with the surrounding nature. City camping is a great option if you are travelling on a budget and prefer to spend your money on shopping, sightseeing, or a festival. In that case, you’ll find quality campsites within a few kilometres of the city centres. Oslo have several. Many campsites have small cabins that can be booked in advance. Standards vary from small and simple to larger, well-equipped ones with common room, separate bedrooms, kitchen, shower, and toilet. Bedding is usually available for a small fee, and you can either clean up before you leave or pay an extra fee to have the staff do it. Hiring cabins is becoming increasingly popular, so we advise you to book as early as possible. Width: 2.55 metres maximum. Note that some secondary roads have a maximum width of less than 2.55 metres. If your caravan is wider than 2.3 metres and more than 50 centimetres wider than the car, white reflectors must be mounted on the front sides of the car’s mirrors. Total length (car + caravan): 18.75 metres maximum. Drivers of cars and caravans with a combined length of more than 12.40 metres must check whether it is permissible to drive the intended road or route. More information: Call The Norwegian Public Roads Administration. Width: 8 feet max. Note that some secondary roads have a maximum width of less than 8 feet. If your caravan is wider than 7 feet and more than 19 inches wider than the car, white reflectors must be mounted on the front sides of the car's mirrors. Total length (car + caravan): 61 feet max. Drivers of cars and caravans with a combined length of more than 40 feet must check from whether it is permissible to drive on the intended road or route. Width: 2.5 metre max. Note that some secondary roads have a maximum width of less than 2.5 metre. If your caravan is wider than 2 metre and more than 45 centimetre wider than the car, white reflectors must be mounted on the front sides of the car's mirrors. Total length (car + caravan): 18.5 metre max. Drivers of cars and caravans with a combined length of more than 12 metre must check from whether it is permissible to drive on the intended road or route. The Norwegian Hospitality Association (NHO Reiseliv) has classified its camping sites with a rating system from 1 to 5 stars. A selection of family-oriented camping sites in Norway by Jan-Henrik Larsen, head of the Norwegian Hospitality Association. German geographer and travel journalist Dr. Thomas Kliem shares his top locations for the needs of your rolling castle.